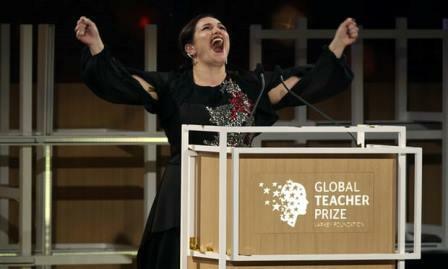 A teacher from United Kingdom has won the prestigious Global Teacher Prize in Dubai - Andria Zafirakou. In a glitzy ceremony on Sunday at Atlantis, The Palm, Zafirakou was awarded the prize by His Highness Sheikh Mohammed bin Rashid Al Maktoum, UAE Vice President and Prime Minister and Dubai Ruler. The whopping $1 million prize was presented the Varkey Foundation. The prize is part of the Global Education and Skills Forum, included 10 teacher finalists who were selected from around the globe, including Turkey, the US and UK, Belgium and the Philippines, among others. 'It was my pleasure to honour - today - the best teacher in the world that won the Varkey foundation's $1 million Global Teacher Prize. Andria teaches at Alperton Community School, a secondary school academy in the inner city borough of Brent. It's no easy task. Brent is one of the most ethnically diverse places in the country and 130 languages are spoken in its schools, according to details provided on the official award website. Its pupils come from some of the poorest families in Britain, many sharing one house with five other families, many exposed to gang violence. Children arrive at the school with limited skills and already feel isolated from staff and one another, making engaging with them all the more vital, but all the more difficult.